Unit is 121” wide x 81” deep x 126” tall. 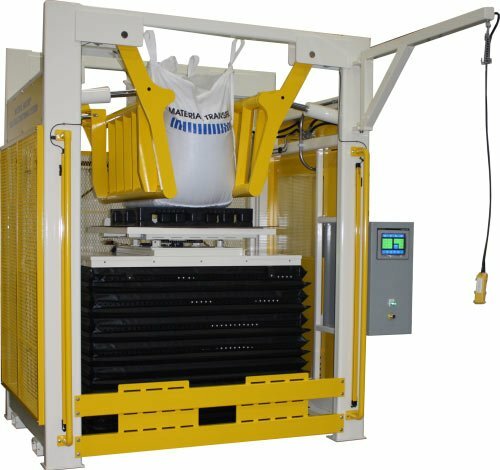 Powered rotary-lift table with 48” of travel allows complete conditioning of a wide range of bulk bags. Unit features tubular steel rotary-lift table guard on load side of equipment designed to provide additional protection during bag loading and unloading. Flattened-expanded safety caging with load side light curtain for operator safety. Forklift moveable feature allows for easy machine transportation and positioning. NEMA 4 electrical enclosure with fused disconnect. Automated control package includes an Allen-Bradley PLC with PanelView C1000 touch screen operator interface allows operator easy access to bulk bag and material conditioning parameters, system status, and manual mode controls. Premium quality Parker hydraulic system with 10 HP TEFC motor. Hydraulic system capable of “zero-pressure” state for maintenance purposes.